We’re not normally prone to patting ourselves on the back about advertising awards. When it comes to winning awards in the advertising industry, we have mixed feelings. On the one hand, it’s nice to be recognized for your work by people who don’t know you, (but who know the business really, really well). On the other hand, being focused on advertising awards is the sort of thing that, when taken to the extreme, can be detrimental to the client. After all, you can create incredible, award-winning work that is coveted by your voting peers that doesn’t do a darned thing for your client and their business. The number and type of advertising awards grows every year. Where once there were mainly ADDYs, CLIOs, the One Show, and the British Design and Art Directors show, there are now scads of these things – some general, and others more focused, such as WEBBYs and EFFIES. There are publications we covet being recognized by, such as Communications Arts, Print, How and Archive. Then you’ve got awards that are even more specialized such as the Healthcare Advertising Awards. (That’s one of the ones we entered this year for the first time with our “Warning to Cancer” campaign for UAB Medicine, and did pretty darned well.) This has been a good year for awards (thus far) so, it feels right to give a public shout out to our clients, our team, all of the effort that went into doing great work, and the validation provided by these award opportunities. We entered a number of healthcare related efforts in the Healthcare Advertising Awards and were pleased to learn that the judges were as happy with the work as we and our clients were. Our logo for the rebranding of Russell Medical, the cancer warning campaign for UAB, and our dry eye campaign for Callahan Eye Hospital all won gold, and the work we did for a number of other UAB initiatives combined for another 10 awards ranging from silvers to merits. Not bad for a first time entering! 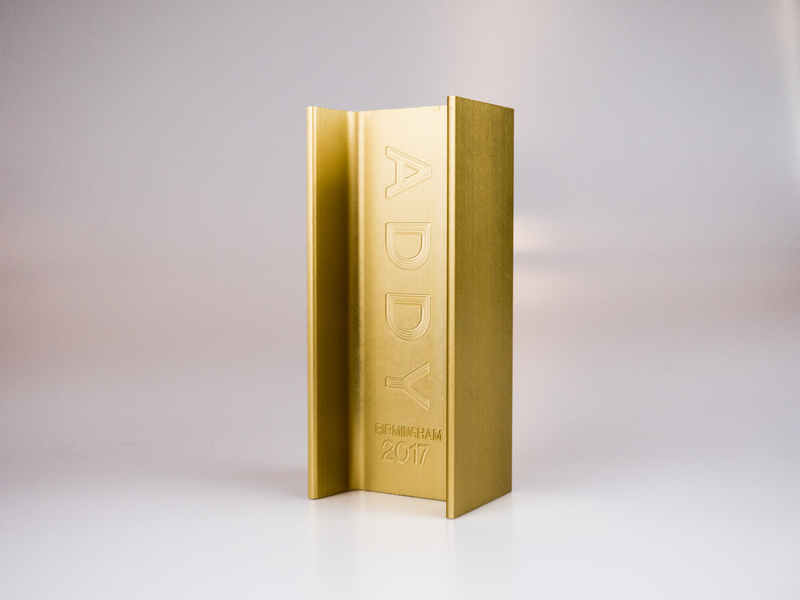 In the ADDYs this year we were pleased to win more than two dozen awards, many of which went on to compete at the district level. A dimensional direct mail piece (we call it a clutter buster) that we did for Altec went on from there and won at the national level. Winning ADDYs here in Birmingham is awesome. Winning them on the national stage is a whole different beast. There, we compete with the big dogs from major advertising markets such as New York, San Francisco, Portland, and the like. It feels good to win against those guys. We also entered the TELLYs for the first time this year and were pleased to win a couple of those for a tablet-based tour app we created for Altec. The cool thing about the TELLY has to be the trophy. It’s downright impressive! With mass enough to serve as a weapon, it looks a bit like an Oscar that’s decided to take flight, and it sits nicely on the shelf. No plastic in that sucker… it’s heavy metal all the way.